Looking for 1&1 IONOS promo codes and coupons? #MasterTheWeb and save money today with our exclusive The Webmaster offers. Special - Significant discounts on all shared hosting packages. Basic plan just $0.99 per month for 12 months (paid yealy). Unlimited Plus just $4.99 for 12 months (paid yearly). Unlimited Pro just $8.99 per month for 12 months (paid yealy). Special - Significant discounts on all WordPress hosting packages. Basic plan just $0.99 per month for 12 months (paid yealy). Managed WP Plus just $4.99 for 12 months (paid yearly). Managed WP Unlimited just $8.99 per month for 12 months (paid yealy). All Cloud Hosting plans now come with $50 free credit, allowing up to 5 months free hosting on the basic cloud server plan. Special - Significant discounts on all Windows shared hosting packages. Basic plan just $0.99 per month for 12 months (paid yealy). Unlimited Plus just $4.99 for 12 months (paid yearly). Unlimited Pro just $8.99 per month for 12 months (paid yealy). Get their Basic Website Builder plan for just $0.99 per month for 12 months (paid yearly). 50% discount available on Plus and Premium Plans. Order a 1&1 A8i dedicated server and get 3 months completely free. Other servers have significant discounts of around 60% off the first 3 months. Cheap and discounted Email Hosting Plans. Get a single email with 2GB storage for $0.99 per month, or go Pro with 15GB and $2 off per month ($4.99). Discounts also available on Microsoft Office Emaill. A selection of domain coupons with registration start at 0.99 per year, including $0.99 .com, $3.99 .club, $2.99 .me, $0.99 .org. Get one month free 1&1 Website Builder Plus when you sign up for the Ranking Coach Basic plan. The option shows at the checkout. Get your first month half price on 1&1 video game servers based on their popular Cloud Hosting. Protect your computer from viruses, spyware, malware and other threats from just $3.99 per month for 1 device or $7.99 for 4 devices. Get a GeoTrust Quick SSL Premium certificate for just $9.99 per year, 66% off the yearly price. 50% off GeoTrust True BUsinessID and GeoTrust True BusinessID EV (Green bar) is also available. Click your chosen 1&1 IONOS coupon code above. The 1&1 IONOS Promo Code will open up a new browser window, and take you to their website when you click it. You will be taken to the relevant page for that Coupon, and you will see the different discounts \ free trials specified. Click your chosen 1&1 IONOS coupon code above. © The Webmaster. After you have clicked on “Continue” next to you chosen plan, a popup box will display that tries to upsell the 1&1 List Local service. Just click “Continue” again to proceed. Click 'Continue' © The Webmaster. 1&1 IONOS provide a free domain with your hosting plan.Enter your desired domain in the box and click the yellow button to check availability. If you do not wish to purchase a domain, just click continue “Proceed without a domain”. I recommend buying your domain separately (see this guide). The next step is to check your order, choose a term (the offer only works with the 12 month term in this example), and select any addons. I personally would not choose any of the addons, or select the free domain (renewal costs are quite high). Select package and any add-ons © The Webmaster. You must then log into your existing 1 and 1 account, or create a new one. You will see at this stage the shopping basket shows $11.88. Log in or Sign up © The Webmaster. Once you have registered, proceed to complete your customer details and enter payment verification to complete your discount coupon purchase. You should receive your new account details within 30 minutes. 1&1 IONOS accept all major credit and debit card, including Visa, MasterCard, American Express, and Discover credit cards. They do not, however, take cash or checks. All payments are completed when you go through the sign-up process, and should be immediately processed (subject to banking speeds on weekends and bank holidays). You will receive the email confirmation of your sign-up, an invoice, and also confirmation of your payment via email. Does 1&1 IONOS accept PayPal? Yes, 1&1 IONOS does accept PayPal. Does 1&1 IONOS accept Bitcoin? No, 1&1 IONOS does not accept payments with Bitcoin. If you need to purchase a domain name or web hosting service with Bitcoin, then we suggest Namecheap. Yes, you can pay monthly. The basic shared hosting plan is just $7.99 per month. Further savings are available if you sign up for a longer period. What other Payment terms are available? You can also pay yearly. The cost is just $6.99 per month when paid yearly in advance. Will my price go up after the hosting plan renews? Yes. If you initially purchased hosting with an introductory rate, or with our 1 and 1 coupons, then your price will go up when you renew. This is because such discounts only apply to the first payment term. Are there any hidden setup costs? No. There are no setup fees for hosting or domains. The only extra costs relate to add-ons you choose during the sign-up process, but you are not required to select any. 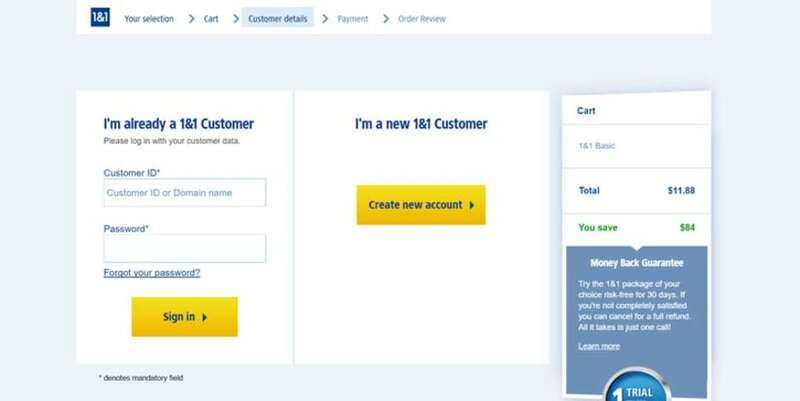 1 and 1 offer a 30-day money-back guarantee, but this is limited to certain services such as their website builder, hosting, eShop or mail package. If you wish to make a claim under the guarantee, you are required to telephone them within 30 days to receive a full refund. Domain name purchases do not qualify and upon a refund being requested the cost of any free domain provided as part of your web hosting package will be deducted from any sums of money due back to you. To cancel, you must complete and fill out a cancellation request form. Yes, a free domain is offered with any website builder or web hosting plan. You only keep this domain name as long as you keep paying for the website builder or hosting service, though; if you don’t plan on using these long-term, paying for the domain name separately can be better value for money. Can I switch between Linux and Window based hosting? Yes, upon request they can transfer your hosting to either operating system. However, all data will be lost during the process, so it is advised to backup your complete data before initiating the process. The transfer from Windows to Linux and vice versa may take a little time. To cancel your account with 1&1 IONOS, you must fill out the cancellation form. If you have prepaid, you will first need to disable prepaid package auto-renewal. You can also contact customer service at 1 (855) 461 6058 if you need assistance with this. Will my domain auto renew? Yes, all accounts are set to auto-renew by default and will be billed by your registered method of payment at the time of expiration. If you wish to disable auto-renewal, you can follow the help guide here. If you have multiple domain names, you can configure these on an individual basis. 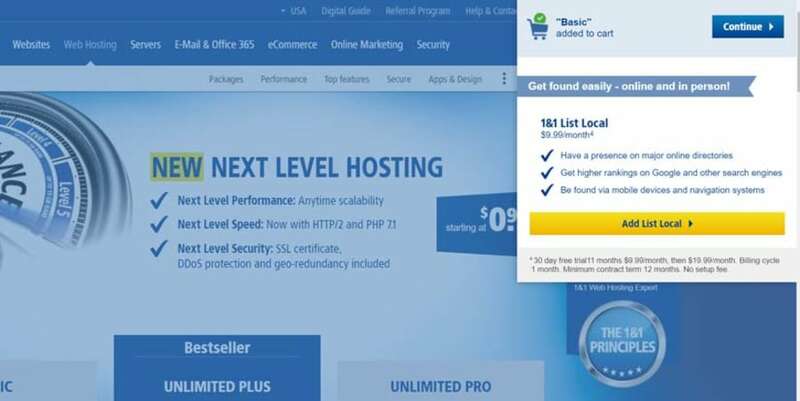 Any free domains obtained as part of the web hosting deal will renew automatically. No. You can toggle between automatic and manual renewal, but you cannot renew your plan before it is due for renewal.